My practice investigates the conscious experience of place as metaphor for unseen or subconscious worlds. Through the juxtaposition of abstracted and representational marks, parallels between natural and constructed landscapes are delineated. Landscape, a direct representation of our environment, alludes to our collective state of being. My images are playful philosophical explorations into ideas of collective identity and cultural myth. Personal experience of contrasting spaces- wild, rural and urban- are a point of departure. Connections are outlined between organic forms and geometric motifs by likening them, also, to the natural and the man-made respectively. A vocabulary of marks are used to interwreathe the macroscopic with the minute thus creating images of imagined terrains that toy with and extricate perspectives. Contemporary landscapes are regularly punctuated by, often absurd, moments of human impact. Correspondingly, dream imagery will bring forward out of place ideas, difficult to decode. Considering Carl Jung's idea of the collective unconscious, these contradictory moments of human impact may emblematically parallel the subconscious experience. I interject my landscapes with unexpected symbols in order to evoke the existential through play or jest. Moreover, I am interested in withdrawing from conventional forms and surfaces, in order to bring landscape painting into a contemporary context. The relationships between reality and fiction, natural and constructed, between waking and dreaming – are mischievously questioned but not defined. My art is about the experience of place and lightheartedly suggests that contemporary landscape may be a direct depiction of our collective subconscious identity. Moving from a small Ontarian cottage community, Esther Hoflick completed her B.A. Honours in Studio Arts from the University of Guelph in 2007. 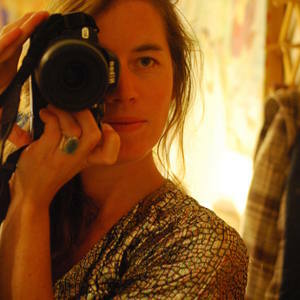 In 2012, the artist moved to Montreal where she now lives and works. Hoflick was the co-founder of the Night Owl Contemporary, a gallery for emerging artists in Montreal, runs The Living Art Room, a small art school, and most recently worked as curator for Artbomb, a daily auction of Canadian art. She was a 2014 recipient of the Quebec Jeunes Volontaires grant. Her work has been exhibited at the Art Gallery of Guelph, Artotheque Montreal, and is represented by Galerie d'Art LSB (Montreal), and Artetch (Dublin Ireland). Jessica Marvels at humanity and toys with ambiguity. 2015 Big and Bold, Saatchi online collection, curated by Rebecca Wilson. 2014-16 Artfetch Featured Collection, Artfetch, Dublin, Ireland. 2011 Hallowed Ground, Culture Days Canada, Ignatious Forest, Guelph, ON. 2011	Slide Lantern, Fourth Fridays, Guelph Arts Council, Guelph ON.